Had been starting to save for a Sport Kite Design vented awhile back. Couple weeks ago a White Sky Burner Widow Maker Pro never flown came up for sale. It is believed that Steve Tapp created 5 of these sails.I am so very pleased and fortunate to have gotten this kite. Kite Party 16 has some nice pics of a Sky Burner Solus flying with this same color layout. Let go 5 kites to get back on track and have no regrets although they will be missed . Prior to today I had about 2 1/2 hours on kite. Not doing much. Just getting the feel. Mostly slides, stalls.Turtles, fades and pancakes. Not forcing anything, just really enjoying it's flight. Today winds were a pretty steady 15 mph. Few gusts bumping 18+ but nothing violent. Put kite together and went up on 100' x 150# line. Kite spun out of control in a right hand spin. Checked kite all ok. Up and same thing. Checked all bridle connections.Bridle ok. Walked line back with my thumbnails. Up and same thing. Remembered about tension release in different sails. Re did lower spreader releasing lower tension. Up same thing. Back to the kite. Took out top spreader and undid stand offs again releasing upper tension. Viola problem solved. Do not ask me why. Something about some sails needing to breath in there 1st few flights.Glad I had read about that or I would have been very frustrated. Maybe damaged the kite. Once underway, couple minutes in perma grin froze my face for the next 2 1/2 hours. WOW!!! Kite is stunning. Hour later went to 100' x 130# and fell in love even more. Kite is very feminine. LIKE A AMAZON WARRIOR !!! Started to name her after the Roman Empress Theodora( born 500 died 548 ). 1 1/2 hour in the incredible controlled nimbleness of the kite changed my mind. She will be called White Widow. Read a few comparisons between the Widow ng and Widow Maker Pro. The following is opinion and not a review. I am not qualified to review. Between 2 and 5 mph kites felt very similar. If doubting these low wind ranges I live at 6200 feet with humidity less then 20% most days. Kick a football and it goes further than in Toledo, Spain (round) or Toledo U.S.A (real football shape ). Maybe that's why. Can't trick in 3 on either but can began to window hunt. Below 3 both come to the ground but with practice I think I'll be able to keep the White Widow aloft a bit longer. Going above 4 and 5 mph the similarities end. Loved my Widow ng and 0 complaints. For me once powered up they are way different. In 15 and a little over the ng would tire me out in a hour or so. The pull while not overpowering and a lot of fun would have me wrist wrapping my handles. The White Widow in 18 mph felt best with 2" finger straps using 1st 2 fingers. 1/2 the pull in 18 then the Widow ng in 12 mph. Widow ng has 4 nose adjustments. White Widow 6. A little tweaking on the ng nose some of that pull would go away. Don't know how and never felt the need to mess with it. For me at it's price point the Widow ng is a perfect kite. Everything is more flowing on the White Widow than any other kite I have flown. I have nothing to really reference it to from personal experience. Seller asked me to post a video so I will. Be a little bit. Want to fly a little better 1st. Got a little more fragile ego than some of you . If you have never flown a Sky Burner Widow Maker Pro and somebody offers you the chance grab those lines before they change their mind. Then make up your own mind. Mine is. I love it.At this point I do not see how a kite can be better than the White Widow. Different and on par yes. Better? I'll see. Mind Trick vented will be here Mon. I am 99.999% sure that I will be just as thrilled with it. It's going to be very different. 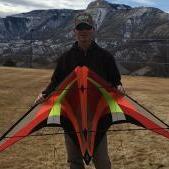 In the next year I think the Zephyr and Hydra will be my most flown kites. They are both tough kites and I got a lot to learn. Taking what I learn and then transposing it to the other kites seems the prudent thing to do. At least that's the plan. Next up Benson Super Nova UL. That is a Spring 2019 goal. If you have a Super Nova to sell (color does not matter)please wait till 3/26/19. I don't think I can take many more gotta have it jitters. Love it! Good to hear how you are going. I've got a SKD 7Vtd and I love it for the lumpy inland winds. The vents really take the edge off. Sent from a Galaxy 8 Far Far Down Under. Find myself going to the SKD site a lot. They look super nice. I know you can put brakes on any kite but theirs look like a brake option was part of the design. Could be that that's just my lack of knowledge. Compared to the few pics Iv'e seen on other kites theirs look like part of the kite not a add on. Velly, velly interesting. You've come a LOONNG way, Breezin, from the time you were looking at a Widow ng!!!!!! I commend your fortitude & determination to master these sport kites! Not always easy, but sure feels good when you do!!!! Thanks this kiting community has been incredibly inspirational. When I was starting I didn't realize how big a part of my life this would become. It's like the more you learn the more you want to learn because it's impossible to learn it all. Started with a crying grand kid asking me to fix his broken kite. Didn't know how but now I do . You would think it would get a little boring trying to do slides 15 times in a row. A little frustrating at times but never boring. I'm on number 14 get set up thinking I'm in the groove. Gonna be a long smooth one this time. Start the slide wind shifts and danged if it ain't the worst one of the day. If that doesn't make you laugh at yourself, well lighten up a bit. The wind doesn't care. I commend your fortitude & determination to master these sport kites! I can do nothing than agree with that. This lasting (and quite verbal) kiting starting intensity is rare and impressive. Go and get that next piece of the puzzle @Breezin! As your skills grow & you look for something 'different' in a kite, you can sell your starter kites, knowing that there are others just starting out in this sport that can benefit from these kites.... & your knowledge! It is quite refreshing to see that newbie energy. I like that! Fly, or don't -- the wind doesn't care. Went out with the White Widow for close to 2 hours earlier. Winds 2 to 3 dropping to 0 at times. Winds started increasing and are now going over 15. On a break and will go back out on the Mind Trick vented. Winds came up and I started getting all excited and brave. Need to be better when I get like that to be flying the WMP. Hydra or Mind Trick time. Question has been posed if on a desert Island and could only have one kite(only 1, violent shudders). Which one. For the longest time my choice has been Zephyr. Today while flying it dawned on me I haven't replaced or re glued a c clip in over a month. Zipping around I started feeling confident that I'm at level 3. As of today my only 1 has now become the White Widow Maker Pro. Man O man I am loving this kite. On that desert Island thing. Due to being the freaky ,fickle, kite flying fool that I am becoming . I have changed my mind. It would be the Mind Trick vented. Having flown both today I am now extremely confident in my choice . For now 😖. I'd rather fly in 23 then 3. No other reason. For now. I sincerely hope that changes. You're gonna love it ---------- eventually. Since I got the White Widow I believe I'm now at level 4. Taken me longer to get from 3 to 4 than 0 to 3. It'll take even longer to get to 5. 8 could be as much as 3 years away .Maybe more. Gets harder the higher you go. Iv'e always admired the skills of watching a great flier.As I get better the appreciation for the finesse it takes to make things look smooth and seamless keeps growing.As does the respect for the time, effort and dedication that it takes.It's not nearly as easy as most of you make it appear. I've been a little intimidated by this kite. Not because of it's nature but because how I got it and who had sewn the sail.It's the one kite I truly cherish. My basic skills are just recently improving to the standards that this kite demands. It is the least forgiving kite I've flown but the most elegant and rewarding. Not the high exciting fun factor on other kites. More like the Lam kites. Something that seeps into your being and is just so incredibly satisfying. I've not read anything from someone who has a Tapp sewn sail with the wing tip tweaks. If you have one please chime in. I'd read quite a bit about WMPs sewn by Heads Up Kites and I'm sure some of the reads were from WMPs sewn by Jon T or someone else. The info I'd gathered was from doing research on the Widow ng. I was more than startled to say the least when I didn't feel the same in comparing the 2 kites. Been some chatter about the Premier Widows lately and been thinking about it. Today winds were running between 10 and 15 mph. This morning towards the low. This afternoon towards the high. A little gusty but very nice winds. Couple hours this morning on the WMP and close to 2 this afternoon on the Nighthawk.Started getting tired. Had such a good day quit early so I didn't ruin it.The end of the day is when I'm most destructive. This is speculation so take it with a grain of salt. Had to sell my 1st Nighthawk to get the WMP. Knew I'd miss it the most and did. My new one has around 12,13 hours in the air. I believe the Nighthawk and Widow Maker were designed around the same time. To me their shape and flight are far more similar than to the Widow ng. Nighthawk being obviously faster and easier to over steer . Due to size easier on the ground work.The Widow ng was designed as part of a series. Don't think it was built to be a cheaper version of the WMP. Designed to be the big sibling in the spider series using knowledge gained from the WMP development.I say this because the smaller Jewel I had seemed more like the Ng than the Pro does.Read the Wind of Change review of the Jewel. 100% agree. Haven't flown a Wolf ng yet.I'm guessing Pam and Dennis started sewing the WMP around the middle of the Spider series development and promotion. Life happens and Steve showed up adding another layer of magic to the kite. Read Steves tweaks on the Blue Moon Elixir. Having been here long enough to realize how much kite people love and appreciate the innovation and progress of others makes me think the tweaks on those 2 kites put a big smile on the faces of Ken and Jon. Now a newbie has a very different opinion of the Widow Maker Pro except that most of us think it's just awesome. Really keen on hearing from the folks who get the next batch of Blue Moons and Sky Burners.Tweaks will have been made.It's what masters do. Hydra has to be replaced because of the way I fly. Love that kite. Don't know what to replace it with other than the Benson Superfly. Been wanting one of those anyways. Watching videos it doesn't seem to be much like a WMP. Now Ken has a next gen Mamba and a couple other kites that I haven't seen disclosed yet up for grabs. I've become pretty enamored with the older kites and how things have evolved around the world. Blew my budget for the Superfly on classic kites and just starting to get it back. Then along comes a run of Blue Moon sport kites. AHH desicions. I'm so confused 😁.